Please note that the content of this book primarily consists of articles available from Wikipedia or other free sources online. 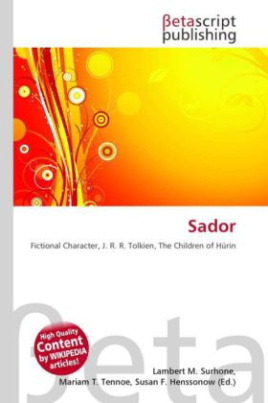 Sador is a fictional character from J. R. R. Tolkien''s Middle-earth legendarium. He was the serving-man of Húrin of Dor-lómin and a friend of his son Túrin Turambar. In his youth Sador was a woodman, but when in Y.S. 455 the Battle of Sudden Flame suddenly broke out, he was summoned by Fingolfin the High King of the Noldor. He arrived to late to participate in the battle, but bore back the bier of Hador his lord and later went for a soldier. Sador defended Barad Eithel in the assault of Y.S. 462, but afterwards his "love of battle was sated," and he returned to his work in the forest as a woodwright but accidentally cut off his right foot with an axe.